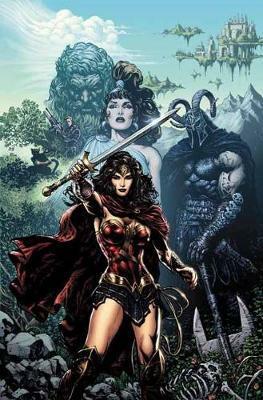 An incredible collection that marks the long-awaited return of legendary WONDER WOMAN writer Greg Rucka, featuring stunning art from Nicola Scott (EARTH 2) and Liam Sharp (GEARS OF WAR)--WONDER WOMAN: THE REBIRTH DELUXE EDITION BOOK 1 collects stories from one of the breakout hits of DC Rebirth. This series is a perfect jumping-on point into the world of Wonder Woman and the first hardcover collection of the new Rebirth series! She is one of the greatest heroes the world has ever known--an icon of equality, a symbol of power, a tireless champion of peace and justice. But who is Wonder Woman really? She's about to find out. Themyscira, the island paradise she left behind to defend Earth from the war god Ares, has vanished, and the magical power of her Lasso of Truth has disappeared along with it. In a sprawling saga that bridges her first year as a hero with the present day, the Amazon Princess must team up with her greatest enemy--the brutal beast-woman Cheetah--to find her vanished homeland and seek the truth about her origins. Can this unlikely alliance save her sisters and the world? Or will Wonder Woman's quest for answers lead to even deeper, darker and deadlier places? Greg Rucka is the New York Times best-selling author of over two dozen novels and far too many comics to count. In the field of comics he is known for his work on such cultural icons as Batman in DETECTIVE COMICS, Superman in both ACTION COMICS and ADVENTURES OF SUPERMAN and Wonder Woman in both WONDER WOMAN and the critically acclaimed graphic novel WONDER WOMAN: THE HIKETEIA. He is the creator of Whiteout (with artist Steve Lieber), Queen & Country, Black Magick (co-created with Wonder Woman artist NICOLA SCOTT) and Lazarus (co-created with his GOTHAM CENTRAL collaborator, artist Michael Lark).